HDFC bank was founded in august 1994. It was among the first companies to receive an ‘in principle’ approval from the Reserve Bank of India (RBI) to set up a branch in the private sector. The bank operated as a commercial bank under the liberalization policies of RBI. In February 2000, this bank experienced a merger with Times Bank owned by The Times Group (Bennett Coleman & co.). This was the first merger between two private banks in India. 1 share of HDFC Bank was received by shareholder of Times bank for every 5.75 shares of their own. HDFC bank acquired Centurion Bank of Punjab on 23 May 2008 taking its total branches to more than 1000. The amalgamated bank came out with a base of Rs. 1, 22,000 crores and net advances of about Rs. 89,000 crores. HDFC Bank Limited provides banking as well as various financial services to different corporations, and middle & upper income customers in India. The bank operates through three main divisions which are wholesale banking, retail banking, and treasury operations. HDFC also provides services like credit cards, debit cards, third party distribution, investment advisory services, card and automated teller machine (ATM) acquiring transactions, and depositary services. Foreign exchange and derivative products is provided by the treasury division. The bank also provides telephone banking, Net Banking, Internet banking, and mobile telephone banking services.It is the largest bank in India by market capitalization as of 24 February 2014. On January 2 2014, the market cap value of HDFC was found to be USD 27.00B, as compared to the credit Suisse group with USD 48.00B. It was promoted by the housing development finance corporation, a premier housing finance company of India set up in 1977. Table 1.1: Achievements of 2014 and 2013. Best of Best Domestic Banks-India. Best corporate in Banking Sector. Best domestic bank in India. Best local cash management bank in India. Best bank- managing IT risks. Best bank- best IT team. To study the satisfaction received by the customer form HDFC staff as well as technical staff in Noida region, Uttar Pradesh, India. To study the areas in which the customer from this particular region invest in. To know the problems faced by the customers. Exploratory design has been selected as data has been collected from questionnaire as well as direct contact to understand the satisfaction level of the customer and to study the areas in which these customers prefer to invest their money. Most of the data has collected from secondary sources whereas for conduct of research the primary data has been collected through a structured questionnaire wherein a total of 120 respondents took part out of which only 100 have been taken into consideration inorder to reduce the error. This data collected is from Noida region only and has been collected according to the convenience of the researcher. The study mainly deals with the satisfaction of the customer in Noida, Uttar Pradesh, India. The required data was collected through a pretested questionnaire administered on a combination of convenience andjudgment sample of 100 individual investors. Judgment sample selection isdue to the time. Respondents were screened and inclusion was purely on the basis of their knowledge about financial organizations, HDFC in particular. This was necessary, because the questionnaire presumed awareness of some basic terminology used in these organizations. The purpose of the survey was to understand where the interest of the customer lies when investing in these organizations depending on various like satisfaction, awareness level. 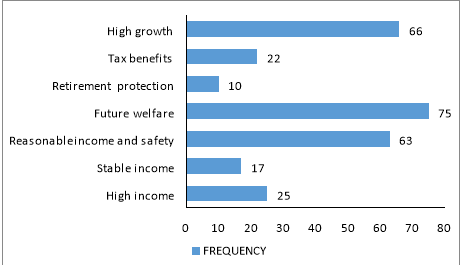 Sample of the questionnaire is given in Annex. A. The primary data was collected through a structured questionnaire by interactions with investors through telephone and through emails. After the data collection, it was compiled, classified and tabulated manually with the help of the computer. It was revealed that the customers were highly satisfied by the communication (80%) followed by the problem solving capabilities (75.24%) of the staff. The customers were not much satisfied by the reliability of this organization. Interpretation: the bank should focus on its ability to perform well consistently and increase responsiveness to attract more customers. The survey was conducted to capture investor objective for investment in financial instruments, reveals the following. Most of the investors invest money for the purpose of future welfare followed by high growth, so company should suggest those instruments which have a positive return for their investment which will help in fulfilling both the objectives. Customers were asked about the reasons because of which they became a part of this organization, the study showed a following results. From the study it was found that 25% people joined this organization because of the image, 25% people because of the extra services and 45% mainly because of the normal services provided by them whereas only 5% joined this bank because of all the above factors. 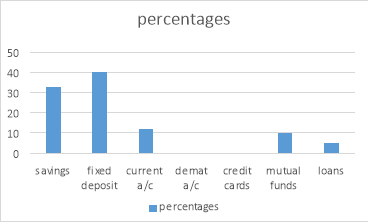 According to the results, the customers find fixed deposit to be the best service provided, followed by savings and currents a/c. not even a single customer opted for demat a/c or credit cards. The customers were given three choices and the result was recorded to know the problems with the services and how to solve them in order to provide better services from the next time. 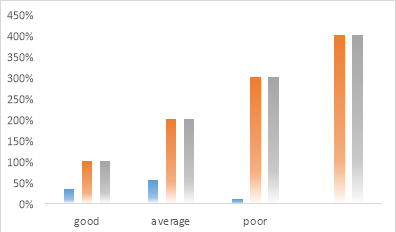 The result clearly shows that 55 % found the service to be average whereas 35 % found to be good. The remaining 10% found the service to be poor. Satisfied with the dealing of bank officials. The pie charts shows that maximum customers were satisfied by the dealing to some extend whereas 30% were completely satisfied. Only 25% were not satisfied and asked to make appropriate changes. Problems faced regarding the bank? 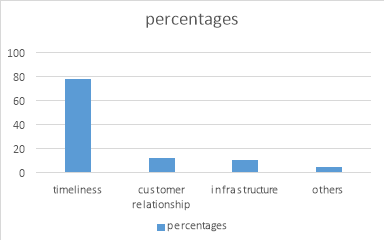 Most of the customers face a problem with the timeliness (78%), whereas only 12 % and 10% people face problems with customer relationship and infrastructure respectively. Will you recommend this bank to any of your friends? According to the result, around 40% of the people agreed to recommend this bank to their friends whereas 25 refused to do so. The result shows perfectly that the customers found the service to be average in terms of customer relations. 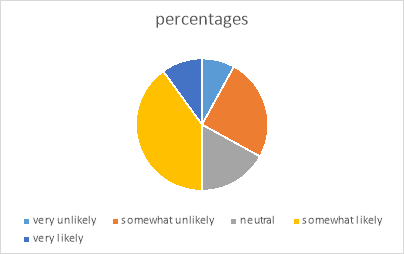 Review from customers show that 48% are somewhat satisfied whereas 21 percent are neutral about the satisfaction level. Only 2% and 9% customer were very and somewhat dissatisfied respectively. Majority of the customers are satisfied with the service provided. 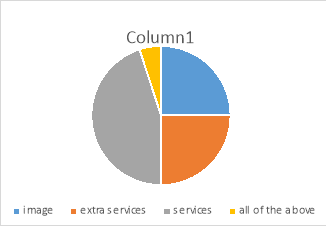 Majority of the customers found the services to be average. They also found that the respondents are average in maintaining good customer relations. Majority of the customers are facing the problem of timeliness. The perception of the majority of the customers is good and are satisfied with the services and were ready to recommend the products of the bank. Majority of the customers are interested in fixed deposits, savings a/c, and mutual funds. 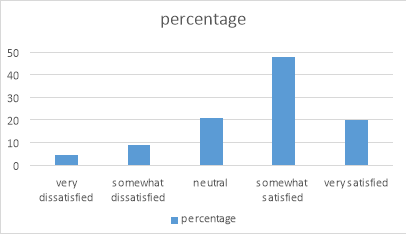 Majority of the customers are satisfied with the dealing of the bank officials. The most important point is that, services provided by the banks attract customers. More stress should be given on advertisement and promotional activities. Banks should improve the efforts to make good relationship with the customers. Enhancing their services should also be an important task. Procedures should be made less time consuming. Banks should inform their customers about their extra services. The research was carried out in a short period of 6 weeks because of which simple random and judgemental sampling is used. The information might be biased because the information collected is given by the customer which doesn’t have any proof and depends upon different customers according to their satisfaction level. At the end I would like to conclude by saying that the Indian banking market is growing at an astonishing rate. HDFC bank have a network of 1142 branches and 3295 automated teller machines in 528 cities in India. The majority of customers are satisfied but the bank should target the unsatisfied customers. Even though the customers are aware about the services, the bank should try to create more awareness among people. HDFC should use printing as well as other media to do so. Formalities should be reduced to a minimum level as the customers feel irritated and the whole process becomes a burden on them. What are your investment objective in HDFC bank? What are the reasons that attract you to be a customer? Best service provided by the bank are? What are your perceptions about the services of the banks? Are you satisfied with the dealing of the bank officials? Any problems you are facing regarding the bank? How likely are you to recommend the services to your friend or family? How will you rate HDFC bank in maintaining customer relationship? What is your overall satisfaction with the company? "Customer Satisfaction Research on Bank." UKEssays.com. 11 2018. All Answers Ltd. 04 2019 <https://www.ukessays.com/essays/marketing/customer-satisfaction-research-bank-1045.php?vref=1>. "Customer Satisfaction Research on Bank." All Answers Ltd. ukessays.com, November 2018. Web. 20 April 2019. <https://www.ukessays.com/essays/marketing/customer-satisfaction-research-bank-1045.php?vref=1>. UKEssays. November 2018. Customer Satisfaction Research on Bank. [online]. Available from: https://www.ukessays.com/essays/marketing/customer-satisfaction-research-bank-1045.php?vref=1 [Accessed 20 April 2019]. UKEssays. Customer Satisfaction Research on Bank [Internet]. November 2018. [Accessed 20 April 2019]; Available from: https://www.ukessays.com/essays/marketing/customer-satisfaction-research-bank-1045.php?vref=1.